Here is a census record I missed the first time I searched. This is the older of the two Dr. Lee-O-Netto ladies. It is always worth taking the time to recheck sources and experiment with search engines. 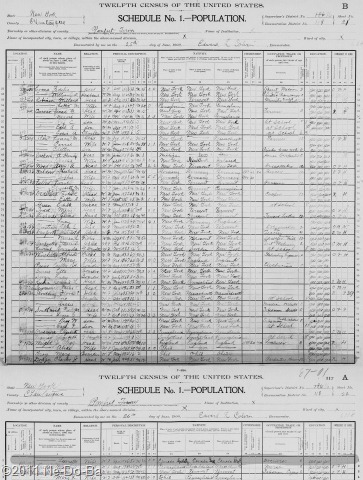 1900 U.S. Census, Pomfret, Chautauqua Co., NY, Pg. 21-22, dated 25-Jun-1900. Charles J., Dodge, head, white, male, b.Jul-1848, age 51, married 12 years, he and both parents born in NY, house carpenter, working full time, he can read, write, & speak English, he rents his home. Leeonetto Dodge, wife, white, female, b.Apr-1846, age 54, married 12 years, no children, she and both parents born in English Canada, self-employed “Doctoress”, she can read, write, & speak English. This is a very helpful census year. I now have a second record giving ages and this year I actually get a month and year for the births. However, I have to wonder if the birth years might not have been mixed up by the census taker. In this census Charles is 2 years younger, but in the last one he was 2 years older. I learned they have been married for 12 years, putting the marriage about 1888. This is rather late in life for both of them, suggesting there may be prior marriages for either or both of them. At least I now have a time frame in which to search for a marriage record. Since they were in Stockton in 1892, just 4 years after the marriage, I think I should look in Stockton first. Lee-o-netto says that she and both her parents were born in English Canada, which usually refers to Ontario. It doesn’t appear this Dr. Lee has any descendants. She states on this census she has never given birth and at 54, it’s unlikely she will become a mother in the future.